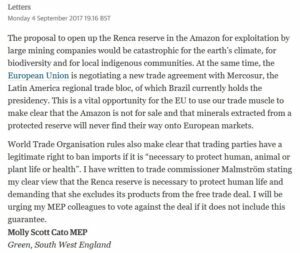 Molly is one of a group of Green MEPs calling on the EU Commission to block all imports extracted from Amazonian reserves in Brazil. The call follows recent proposals by the Brazilian President, Michel Temer, to open up at least 30% of the 46,000 square kilometer Renca reserve – an area the size of Denmark – to mining and large-scale agroindustry. In a letter to Trade Commissioner, Cecilia Malmström and Commission President, Jean-Claude Juncker, the MEPs urge the Commission to use the EU-Mercosur Agreement, a new trade deal currently being negotiated between Latin American countries and the EU, to prevent further destruction of the Amazon rainforest. With Brazilian imports into the EU being dominated by primary products – over a quarter of which are minerals – Greens fear the deal could do the opposite and encourage European extractive and agribusiness to exploit exports from areas like the Renca reserve. The Green MEPs also urge the Commission to remind Brazil of its commitment to the UN Convention on Biological Diversity and point to WTO rules which say that trading parties have a legitimate right to ban imports on products if it is “necessary to protect human, animal or plant life or health. Although a Brazilian court last week blocked the attempt by President Temer to open up the Renca reserve, it is likely to be only a temporary reprieve for the area. Previously higher court judges have overturned rulings made by local courts.